At Rabbit Rescue and Friends, we think that every animal is important and it is our job as owners to give them the best quality of life possible. Not only that, the Animal Welfare Act 2006 outlined several requirements for ensuring minimum standards of welfare, so not keeping any animal (including rabbits and other small furries) correctly is now against the law. What Do I Need to Do to Adopt from Rabbit Rescue and Friends? 1. Learn about what care and equipment your rabbits will need. Start by reading our fantastic Rabbit Care Guide here, for lots of essential advice and information. 2. Send us a picture of your hutch and run. (such as a living room) to run around in, or outside in a hutch with permanently attached run. The hutch should be a minimum of 6ft x 2ft x 2ft with a perminantly attached run of 6ft by 8ft to meet legal requirements but we still feel this is on the small side. Virtually all hutches that are sold in pet shops are too small, so If possible, we recommend buy and modify a shed. This will give your rabbits a cosy but spacious and well-ventilated space to live in, at around the same cost as a hutch. Your attached run should be available all of the time for your rabbits to exercise in. In the wild, rabbits can run up to 5 miles a day, so we recommend a very minimum space of 10ft by 10ft for daily access and the minimum of 8ft by 8ft at night (hutch with attached run). Most importantly, please go as big as you can afford. Rabbits should then be given a minimum of 4 hours (everyday) to free range in an enclosed garden - supervises or area of the house. Constant access to clean water and a balanced diet. This means 80% hay, 10% veggies, 5% good quality pellets (not muesli, as this can cause an unbalanced diet) and 5% healthy treats. This will help keep teeth (which grow constantly) and gut in good working order. Burgess Excel (Adult or Junior/Mini), Science Selective and Protexin Profibre are all good quality pellets. 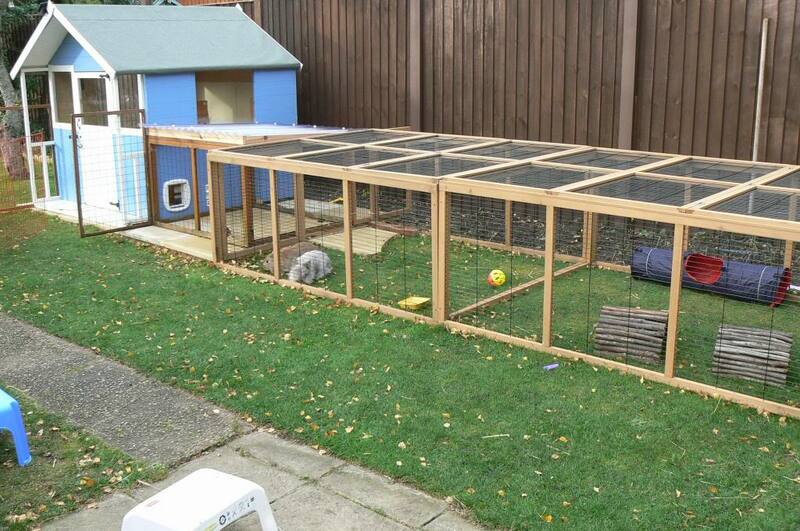 A suitable hutch and run (see above for information, and our guide for advice on creating the best set up for your rabbits). A deep layer of straw should be provided to sit on (or hay if your rabbit is prone to sore hocks). Litter trays should be cleaned out every day and the whole hutch cleaned out a minimum of once per week. Companionship. At Rabbit Rescue and Friends, we don’t rehome rabbits singly, unless you already have a bunny that needs a friend. Even with human company, these highly social species can become extremely stressed when kept alone. Whilst having a companion may cost slightly more in food and produce more droppings, the benefits for your pet far outweigh the disadvantages. Getting your rabbit a neutered friend is the single thing you can do to make the greatest difference to his quality of life. When you adopt with us we ask that when one of your companion pair passes away, you either agree to adopt a new companion for them or return them to us so we can rehome them in a new pair. That way we can help to ensure that each rabbit has the best possible quality of life, even in their older years. Rabbits are regarded as ‘exotic’ and many vets don’t have more than basic knowledge about how to treat them. It is worth finding a vet who is used to treating rabbits so you know that yours will receive the best and most up to date care. Once you have found one, request prices for the cost of a consultation, vaccinations and worming/mite treatments. This will help you to plan annual preventative healthcare costs. Note: Your rabbit needs to be vaccinated against both Myxomatosis and Viral Haemorrhagic Disease (VHD) and a combination vaccine exists for this. However, an additional strain of VHD (RVHD2) has also been identified, and this is also highly contagious and almost always fatal. A vaccine is now available in the UK, so please ask your vet to also discuss with you vaccinating against this strain too. Adopting rabbits is a big responsibility and as they can live up to 10 years, so it is also a long term commitment. Adults in the house should be primarily responsible for the care of your rabbits and children should always be supervised when interacting with them. Rabbits don’t enjoy being picked up so this should only be done if necessary, and by an adult. We strongly advise that children do not pick rabbits up, as they are challenging to hold securely and have delicate spines that can be broken if held incorrectly or dropped. Finally, rabbits should NEVER be bathed or washed with a shower – soaking of this kind can cause shock and hypothermia. ‘Trancing’ (flipping a rabbit on its’ back) is also a big no – this causes an instinctive ‘play dead’ response where breathing ceases. If breathing fails to restart, this causes a heart attack and is likely to result in death. 6. Learn the signs that your rabbit is unwell. There are only a handful of companies that provide pet insurance – one of these is Pet Plan, who provide a comprehensive package for rabbits. Whilst it is not essential to have insurance, many owners say that they like the peace of mind that comes with having it. That way, if their rabbit requires treatment for common conditions like sore hocks or life-threatening issues like GI Stasis, they know that treatment is not restricted by lack of finance. Rabbits typically cost around £11 per month to insure (correct Oct 2016). If you decided against insurance, it may be worth putting aside some money each month, to help pay for unexpected vet bills. All of our rabbits will be neutered and vaccinated (myxo/VHD and VHD2) before leaving for a new home. Please ensure all rabbits are kept up to date with vaccines and make sure any exsisting rabbits are up to date before adopting another. Our minimum adoption fee is £40 per rabbit. Our average cost for a healthy rabbit is in excess of £90, so we are always gratful for any addional donations. Thank you. ...And that's it! You are now ready to adopt! Contact us to get the ball rolling.